- Ella, after one EXTREME day in class with Jason. 2. Video - Watch the video before learning the definition. Students always want their teachers to like them. But some go too far, and those are called teacher’s pets. The teacher’s pet wants to be loved by the teacher above all else. The teacher’s pet isn’t always the best student in the class, but is the one who tries the hardest to please the teacher. The teacher’s pet will bring gifts to the teacher and say nice things to him or her. Of course, these aren’t bad things to do, but the teacher’s pet does them too often and just to get ahead of the rest of the class. In Amy’s class, Jason is the teacher’s pet. He runs up the stairs and pushes Jeff out of the way in order to open the door for Amy. Then he gets Amy a pizza and beer. He answers all of the questions in class. 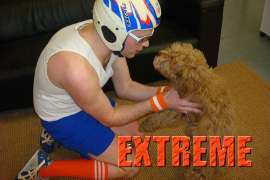 These are all typical behaviors of a teacher’s pet...taken to the EXTREME! In a way, the teacher’s pet is dishonest. He or she doesn’t really care about the teacher, only about being liked. For that reason, the teacher’s pet usually isn’t popular with the rest of the students. As you can see, Jeff and Ella get frustrated with Jason. Being a teacher’s pet usually doesn’t work out for very long. When Amy shows up with her dog, Jason gets jealous! Have you ever met a teacher’s pet? I think it refers to a pupil who has won the teacher's special favor. teacher's favorite/one who is favored by the teacher. Extreme lessons are the best! I known some partners in the highschool acting like that, thanks for sharing was a good work. haha:’D i like this lesson.i know one.she acts like that. I prefer that there be competition among the students. This is a funny lesson. I know someone who is a teacher's pet, too! i don like teacher's pet , even though i am a teacher. This is a funny lesson! a student want to be treat very special (apparently special treatment), he/she will do cunning way just to please the teachers and become ahead of the class.